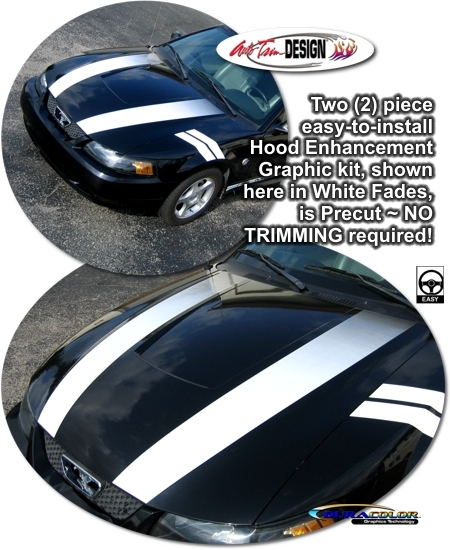 Highlight your '99-'04 Ford Mustang's hood contour with these unique Hood Graphics that start as solid at the front of the hood and fade to your vehicle's paint scheme to the rear. Easy to install, kit is available in four (4) fade colors. Moreover, graphic pieces are covered with a durable 2.5 mil clear laminate which will protect the graphics from miles of abuse. This stripe package is obviously not just a set of straight strips in a box. Our graphic kit consists of prefitted and contoured pieces as shown in the illustration. Kit is specifically made for the Hood as shown in the image generally found on '99-'04 Ford Mustangs (Ford OEM Part #3R3Z16612AA) and will not fit any other hood type or vehicle. Precut Le Mans Style Hash Mark Kit (ATD-FRDMSTNGGRPH197) shown is not included with this kit.